A Benedictine abbey, the Church of San Pietro was founded in the 10th century. The main court is dominated by the polygonal clock-tower, allegedly built on the site of an Etruscan tomb that was used for its construction in the 13th century. After a partial collapse, the upper section was rebuilt in 1463. Rich in art, there are frescoes dating from the 14th century as well as paintings by Perugino. The interior is a mixture of ancient columns and has a Palaeochristian basilical structure. The Gothic wooden choir is considered to be one of the finest in Italy and was completed between 1525 and 1591. 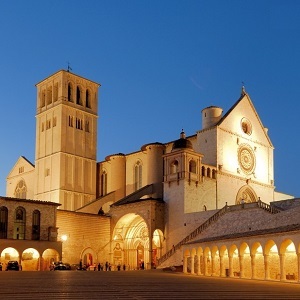 The Basilica di San Francesco houses the mortal remains of St. Francis of Assisi since the year 1230. Visited every year by pilgrims from all over the world, it has been included in the UNESCO World Heritage List during the year 2000. The complex consists of two superimposed churches, the Basilica Inferiore (1228-1230) and the Basilica Superiore (1230-1253), as well as a crypt realized in 1818 which contains the tomb of the saint, a simple sarcophagus resting on the rock. The greatest masters of the thirteenth and fourteenth centuries, such as Cimabue, Giotto, the Lorenzetti brothers and Simone Martini, frescoed the walls and the ceilings of the two churches. There are also works by Cavallini and Jacopo Torriti. Beautiful stained glass windows by Giovanni di Bonino and Puccio Capanna and remarkable choir stalls crafted at the end of the fifteenth century embellish the Basilica Superiore. 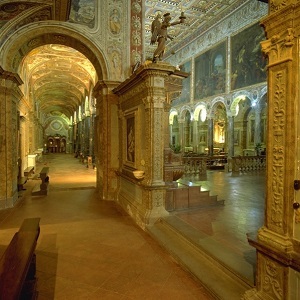 The school of great Italian painting was born in the Basilica Inferiore: in the nave you can admire the frescoes by the Master of St. Francis, the chapel of St. Martin shows the complete cycle of the Stories of the Saint painted by Simone Martini, the chapel of Mary Magdalene was frescoed by Giotto, a fresco by Cimabue is admirable on the right transept and on the left transept Pietro Lorenzetti painted some scenes from the Passion of Christ. The North-European Gothic style was revised in a more simple ritual expression, according to the Franciscan motto of the exaltation of Poverty. The Sovereign Military Order of Malta, owner of the Castle of the Knights of Malta in Magione, was founded about nine centuries ago in Jerusalem with the aim of protecting the Holy Land. Originally called the "Order of St. John of Jerusalem", it is one of the most ancient institutions of western and Christian civilisation. The castle dates back to 1150-1170 and was meant as a shelter for pilgrims going to Rome or to Jerusalem, also being conveniently located close to the Via Francigena which was used for travelling to Santiago de Compostela. The present structure is the result of several changes during the centuries. The courtyard where the concerts are held dates from 1471. In the oldest part of the castle, there is a Romanesque-styled church with a rounded vault honouring St. John the Baptist. Inside are two precious frescoes of the school of Pinturicchio, dating from the early sixteenth century. 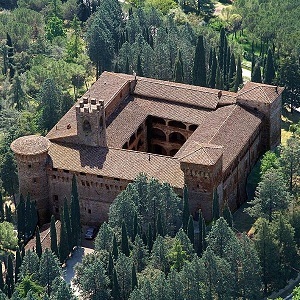 In 1502, the castle was the seat of a conspiracy organized by some Italian noblemen against Cesare Borgia, known as the “dieta alla Magione nel Perugino” and which Machiavelli refers to in The Prince. Today, with its headquarters in Rome, the Order carries out its activities in 110 countries and succeeds in engaging volunteers all over the world for humanitarian assistance and social activities. The Order has diplomatic relations with 92 countries as well as with European organisations and a seat at the United Nations. It is neutral, impartial and non-political, which is why it can successfully act as a mediator. The farm of the Castle of the Knights of Malta produces 100,000 bottles of wine each year, with production rising steadily. It also produces extra virgin olive oil. Placed in the restored ancient rooms of the castle, the cellar is a beautiful example of tradition and innovation. 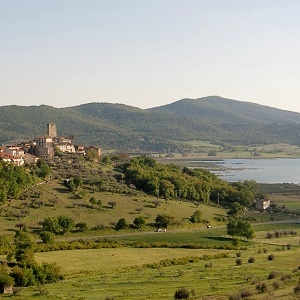 From San Savino there is a wonderful view of the south end of Lake Trasimeno and the Isola Polvese. The first documents in which the town is mentioned date from 1006. Only the tower remains from the former castle. The piazza is in front of it, surrounded by the homes of the local residents. The Sala Podiani is in the Palazzo dei Priori, above the Sala dei Notari, in the centre of Perugia, and it was originally used by the Capitano del Popolo. There are fragments of frescoes on the walls, and we can recognise a few family crests of the 14th century. The imposing wooden ceiling was rebuilt in 1893. The name Podiani comes from the bibliophile Prospero Podiani, who donated to the municipality of Perugia part of his library in 1582; the books were stored in this beautiful room until 1968. 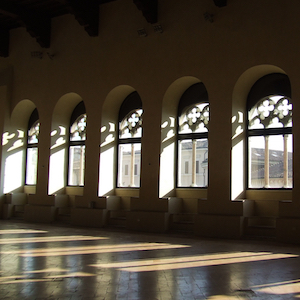 The Sala Podiani is now an integral part of the Museum of the National Gallery of Umbria, and is used for temporary exhibitions, concerts, conferences and other cultural activities. Designed by architect Carlo Gatteschi in 1854, the Teatro Signorelli has been an important venue for cultural events for over a century and a half. 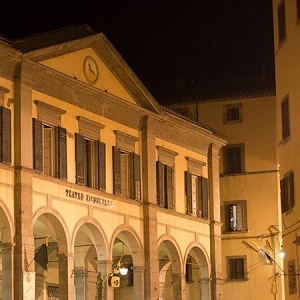 Property of the Accademia degli Arditi, the Teatro is located in Piazza Signorelli, in the centre of Cortona, where the ancient Church of Saint Andrew once stood. It is an architectural work of great importance and was designed in neo-classical style. The loggia consists of seven arches and two rows of eight columns with vaulting and lunettes. The programming has always been lively and of the best quality. The Teatro has also been used for many years as a cinema and conference room, and has a café.